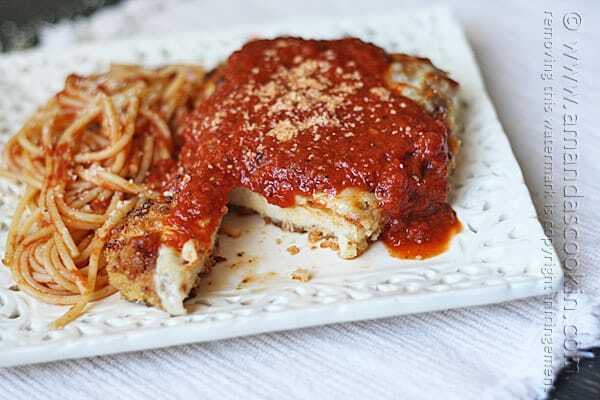 Chicken Parmesan is an Italian-American dish that is derived from popular tomato based Italian casserole dishes known as parmigiana. 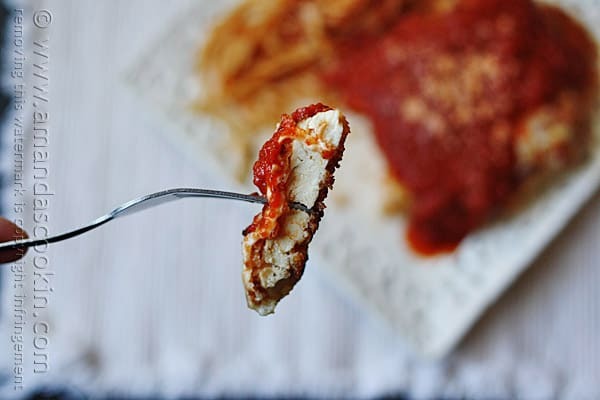 Eggplant is the most common filling (see our Stuffed Eggplant Parmesan recipe), deep fried then baked in a dish layered with cheese and tomato sauce. 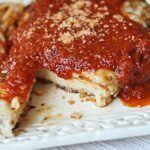 The Americanized dish chicken parmigiana is often baked in a casserole dish, smothered in too much sauce and cheese for my taste. I prefer that the breading on my chicken be crispy, and that the sauce be a compliment rather than something that causes my breading to get soggy. I want to be able to taste each component of the dish… the crispy breaded chicken cutlet, the delicious melted cheese, and the wonderful marinara that accents it all. If you’ve only ever had this dish in its smothered version, I urge you to try it this way. You can taste everything and the flavors are delicious. The breading doesn’t get mushy or soggy and it’s a joy to eat! 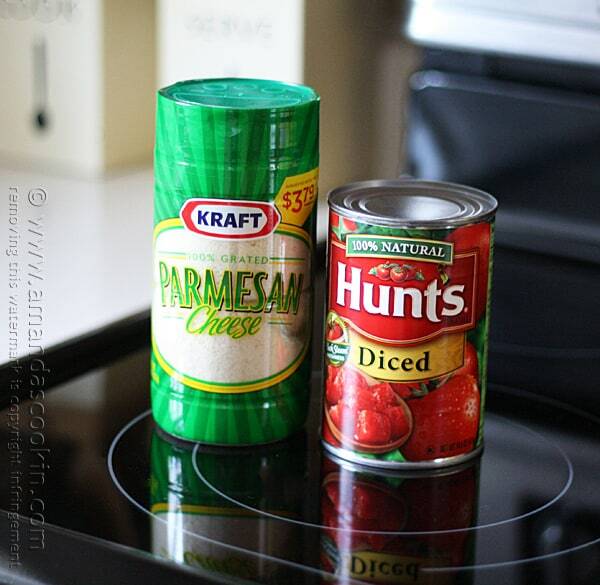 My homemade marinara sauce recipe is here, but for this recipe I tweaked it a little. With it being the dead of winter, I don’t have my fresh herbs to pick from so I used dried and different varieties. I also tried something a little different, just in the method of how I prepared it, so you can find all the instructions in the printable version at the end of this post. 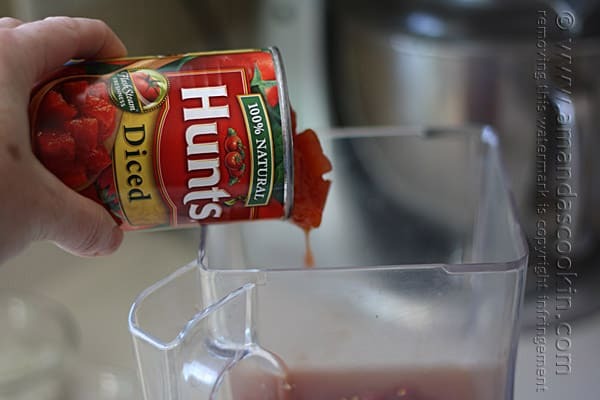 I started by emptying two cans of Hunt’s diced tomatoes and a small can of tomato paste into my blender. Instead of water, like my original recipe calls for, this time I used chicken broth; add that to the blender too. Pulse the blender a few times until it’s all a smooth consistency. Set it aside. 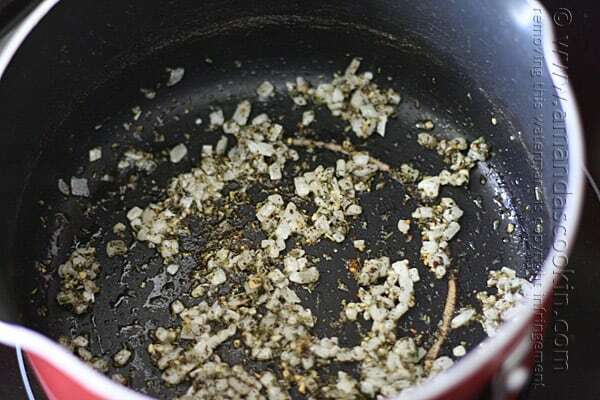 Saute diced onion in some warmed olive oil. Add the garlic and give it a quick stir, then add the dry herbs and black pepper and sauté for about a minute. Doing so really makes dried herbs fragrant. Add the wine. It will boil down a little, stir and cook for a couple of minutes. 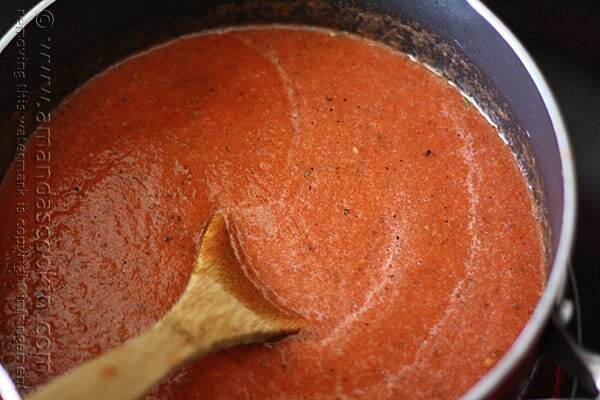 Finally, add in the tomato mixture that’s in your blender. Stir it well. Bring the sauce just to a boil. Turn the heat down and let it simmer for about 20-30 minutes. The sauce will thicken a bit. 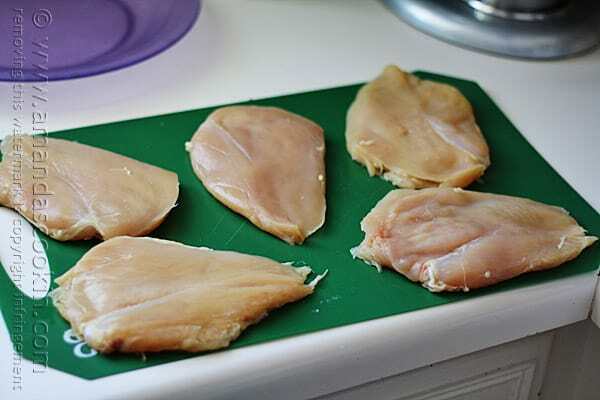 While the sauce is simmering, pound chicken breasts between sheets of waxed paper to a 1/2-inch thickness. You want all the chicken to be evenly sized so they all cook at the same rate. Set up your dipping station. 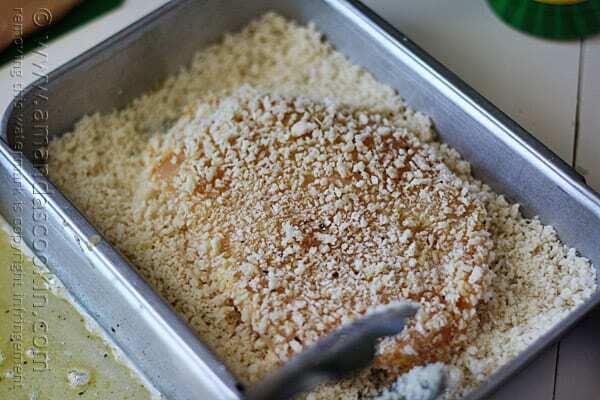 Once dish should have 1/3 cup flour (all purpose is fine), the next should contain one beaten egg, and the last one should have one cup of panko bread crumbs. Give each dish a twist or two of freshly grated black pepper and a pinch or so of sea salt. 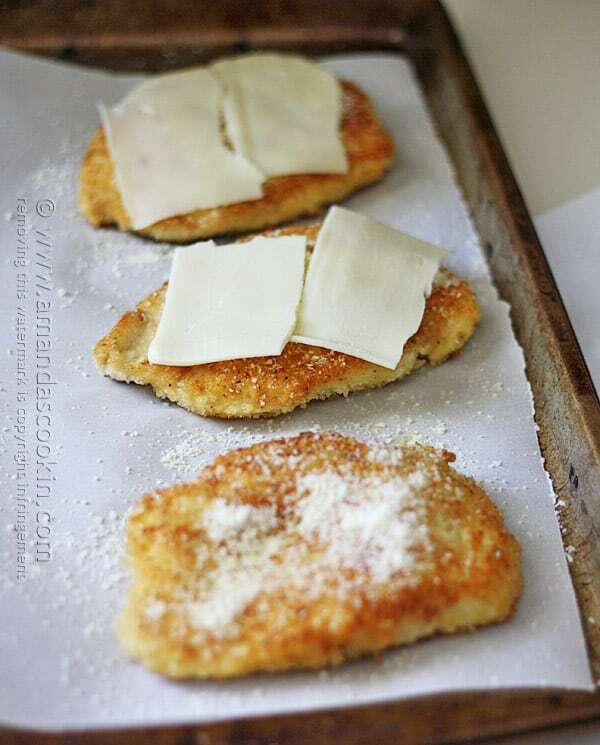 Measure out 1/4-cup of Kraft Parmesan cheese and toss it with the panko. 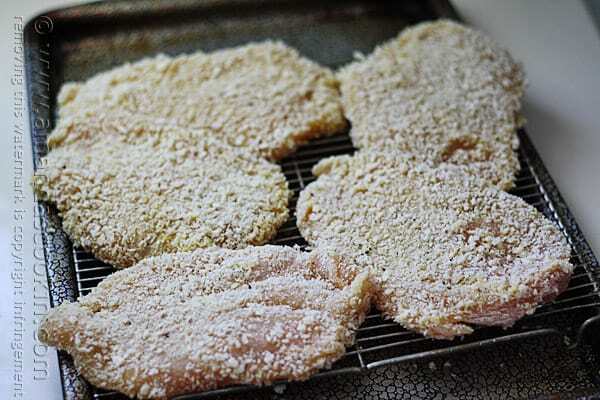 Use tongs to coat each chicken breast lightly in flour. Next, dip in the egg. And finally in the panko. 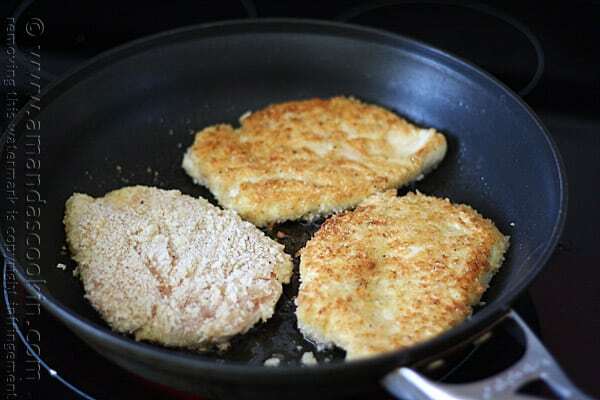 Place the breaded cutlets on a wire rack and let them sit for about five minutes. According to the cookbook Italian Classics by the Cook’s Illustrated Magazine Editors, allowing them to dry for five minutes keeps the breadcrumbs on the chicken and not stuck to the skillet. Heat olive oil in a non-stick skillet over medium-high heat. 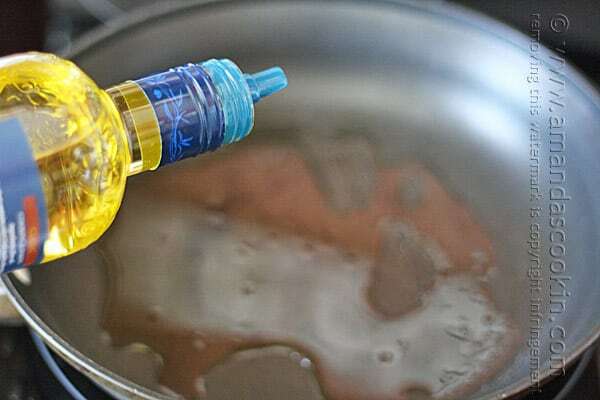 Heat the oil until hot, but not smoking. Hint! Now is when you should put a pot of water on to boil if you plan to serve a side of spaghetti with it. Cook the chicken in batches, about 2-4 minutes per side, depending on your stove. They should get nice and golden brown. Cook on the other side for 2-4 minutes, or until golden. This is about the time you should add your spaghetti noodles to the pasta water. 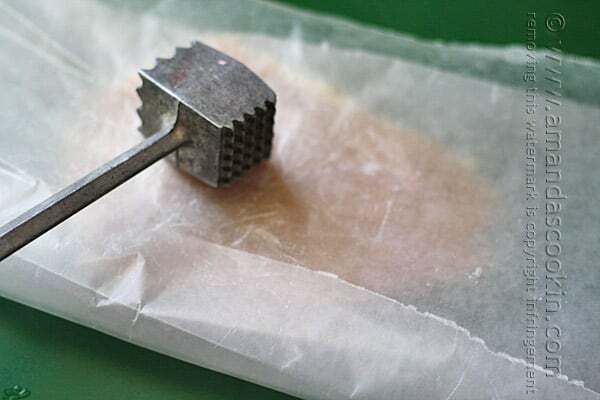 Place the breaded cutlets on to a parchment lined baking sheet. Top each one with a sprinkling of Parmesan and a slice of Mozzarella cheese. Bake in a preheated 400 degree (F) oven for 8-10 minutes. 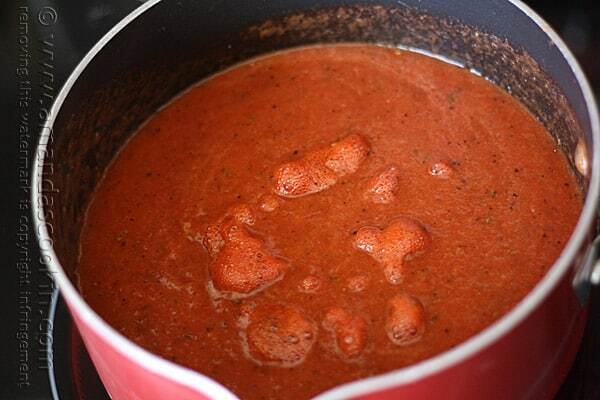 Hopefully your pasta is done now and you can drain it and toss with some of the marinara. 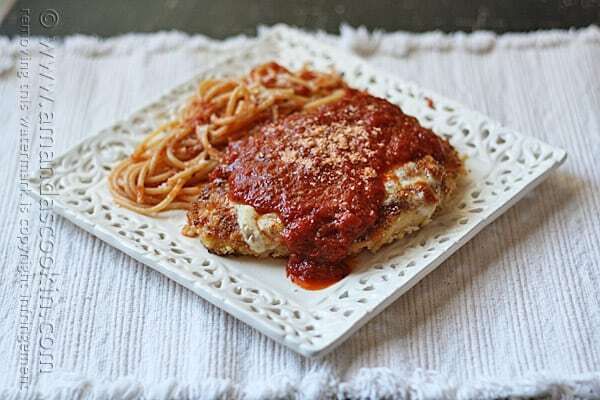 To serve, add a side serving of pasta to the plate (the pasta is a side in this dish, not the main course) and place breaded cutlet beside it. 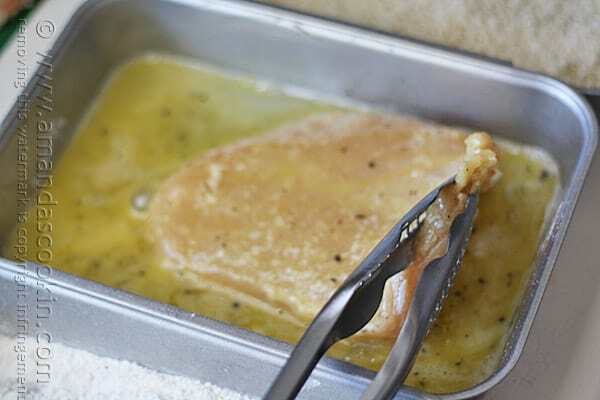 Ladle some sauce over the breaded cutlet, but don’t drown it. You won’t regret it. Because it’s delicious. Cross my heart. 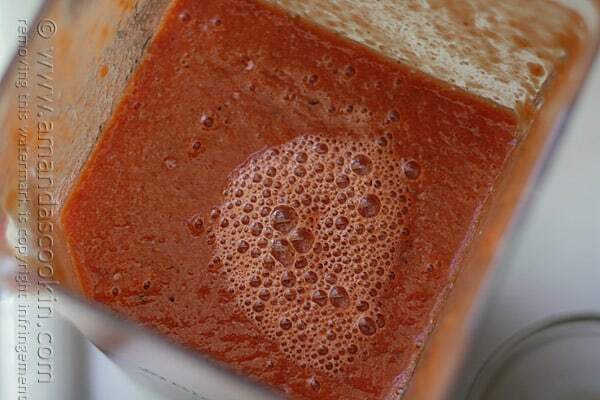 Combine tomatoes, tomato paste and chicken broth in a blender and pulse until smooth. Heat 1 tablespoon olive oil in a medium saucepan. 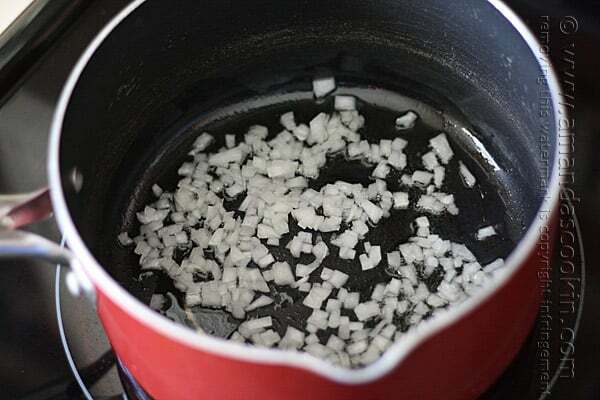 Saute onion for 3-4 minutes, until tender. Add minced garlic and saute 30 seconds. Add dried herbs and black pepper and stir until fragrant, about one minute. 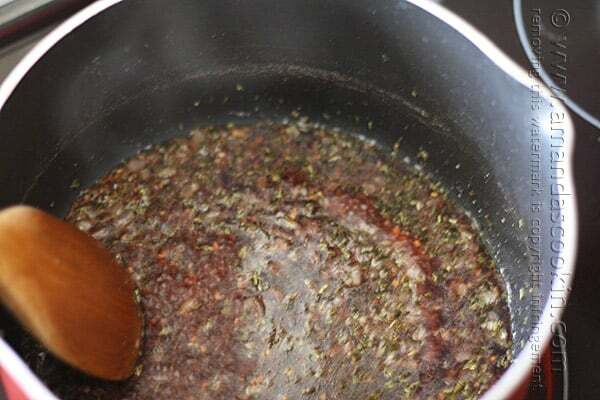 Add red wine and allow to boil for 2-3 minutes, stirring gently. Season with a sprinkling of sea salt. Add the blended tomato mixture and bring just to a boil. Reduce heat and simmer 20-30 minutes, until slightly thickened. Set up your dipping station. 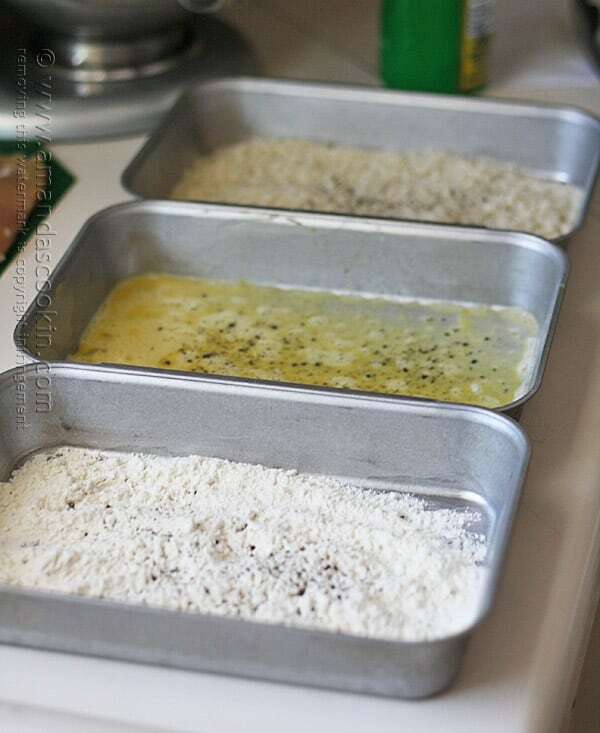 One dish should have 1/3 cup flour (all purpose is fine), the next should contain one beaten egg, and the last one should have one cup of panko bread crumbs. Give each dish a twist or two of freshly grated black pepper and a pinch or so of sea salt. 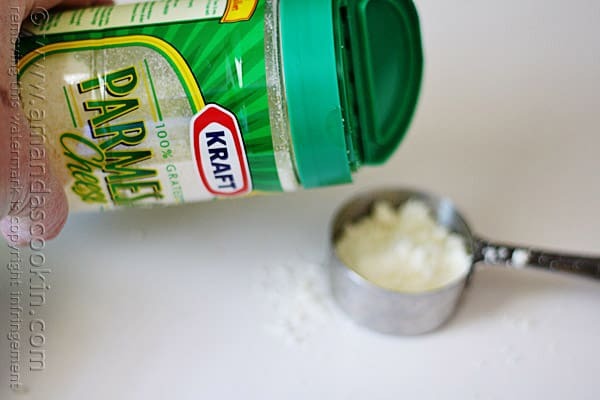 Measure out 1/4-cup of Kraft Parmesan cheese and toss it with the panko. 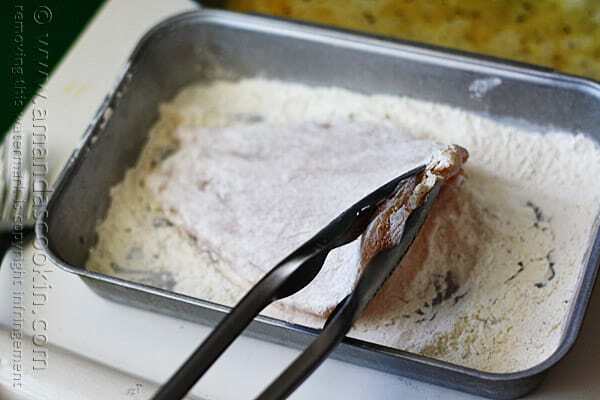 Use tongs to coat each chicken breast lightly in flour. Next, dip in the egg then finally in the panko bread crumbs. 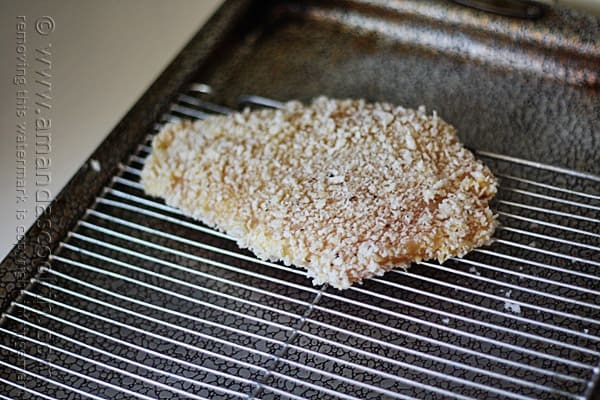 Place the breaded cutlets on a wire rack and let them sit for about five minutes to dry. Heat 2 tablespoons of olive oil in a non-stick skillet over medium-high heat. Heat oil until hot, but not smoking. If the oil reaches a smoking point, start over. Cook the chicken in batches, about 2-4 minutes per side, depending on your stove. They should get nice and golden brown. Cook on the other side for 2-4 minutes, or until golden. 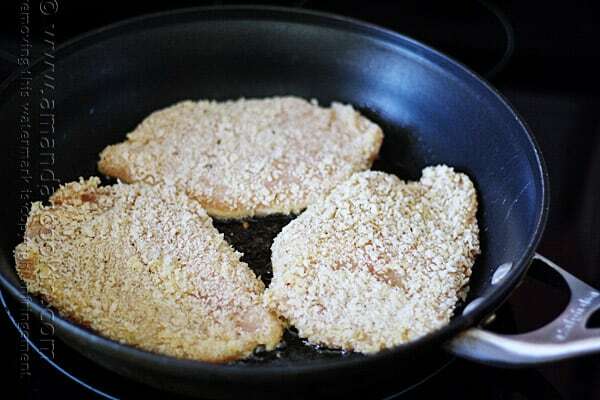 Add more olive oil to the skillet for the remaining chicken breasts and cook on both sides. Add your spaghetti noodles to the pasta water. 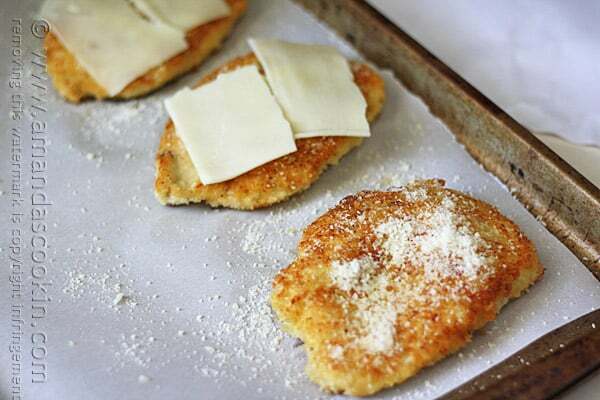 Place the breaded cutlets on to a parchment lined baking sheet. 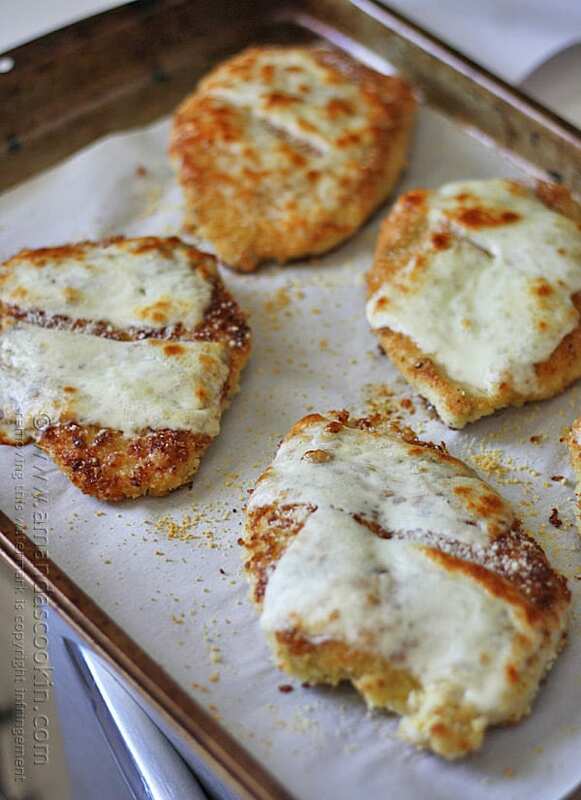 Top each one with a sprinkling of Parmesan and a slice of Mozzarella cheese. Bake in a preheated oven for 8-10 minutes. 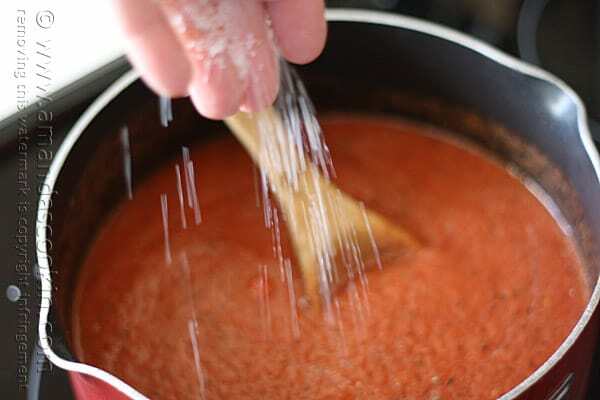 Hopefully your pasta is done now and you can drain it and toss with some of the marinara. 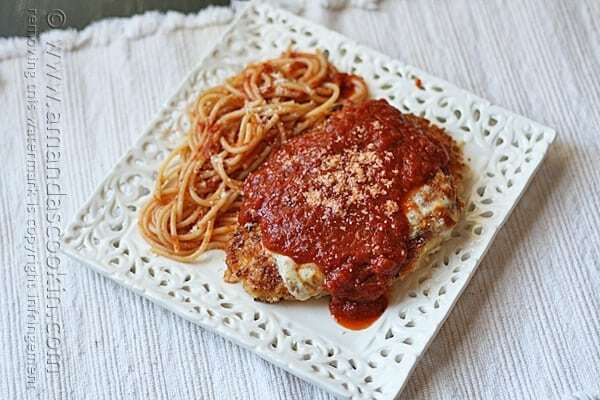 To serve, add a side serving of pasta to the plate (the pasta is a side in this dish, not the main course) and place breaded cutlet beside it. Ladle some marinara sauce over the breaded cutlet, but don't drown it. You MAY need an additional egg. I was able to get all 5 cutlets breaded with one egg, but the last cutlet wasn't completely covered. I did not break open a second egg, I just made due with what was left and it was fine. What kind of red wine did you use? Can you use as a substitute red cooking wine in the grocery store? I have used something as sweet as Port wine and as dry as Merlot. I have not used red cooking wine for this. 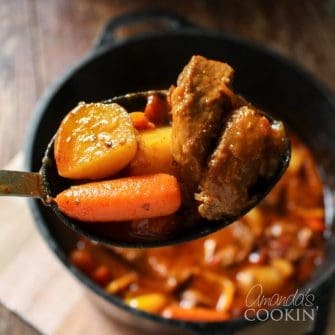 You can substitute beef, chicken or vegetable stock though if you prefer! I’ve been looking for a really good chicken parmesan recipe Amanda! This is my favorite dish so I hope this is a keeper. Please email me this recipe so I can try it soon, thanks. Loved this post! That is pretty much how I do my chicken parm, except that I have not done the “air drying” for 5 minutes. Will make sure to incorporate that step next time. That is one of my husband’s favorite dishes, he asks for it all the time…. Gorgeous, my mouth is watering. Awesome Vivian, so glad you liked it!